Publishing six issues per year, The Breast is an international multidisciplinary journal for clinicians focussing on breast cancer prevention and therapy. Participants of courses of the IBUS Breast Imaging School can purchase The Breast for an educational subscription rate of €52.00 (fifty two Euro). This entitles you to a print plus online subscription. If you wish to receive The Breast at the educational rate of 52.00 Euro, please send your request for the code to the IBUS Secretariat by completing our Contact form. The code will be sent to you by return email. 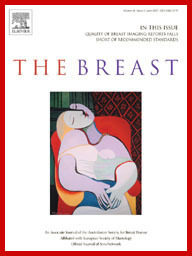 Please contact Elsevier’s Customer Service Department in your region to order your subscription to The Breast. You will need to quote the code to be eligible for the IBUS educational subscription rate of 52.00 Euro.